After months of clashes with angry students, the university decided that the young professor it hired had to go. From the day of his first class on campus, protesters had disrupted his lectures. Police had to clear angry students out of the room each day. Officials feared for the professor’s safety and appealed to students to respect his freedom to teach, but the students responded with a manifesto declaring that the offending professor must be dismissed and “a new university of a political nature built up.” They said they were entitled to the teachers they wanted, not someone like him. Some of the faculty defended the professor and complained about students who cared more about politics than learning. Many others, however, said that life at the university would be much easier if, in the future, the administration would more carefully evaluate the views and identity of prospective faculty members before hiring. Better to screen out anyone who would upset student sensibilities than continue to have turmoil on campus. The administration finally caved in to the pressure, first suspending the professor’s class and then terminating his employment. The students had won; the university was cleansed and the administration had been taught a lesson. All of that sounds like a story from some American campus in the 21st century, but in fact, it is a description of the clashes between pro-Nazi students and the University of Breslau in 1933 following the appointment of a Jew, Ernst Cohn, to teach law. It is disquieting that more than 80 years later, we find exactly the same ideas about education and the same eagerness to resort to disruption among some American students as among young enthusiasts for National Socialism back then. 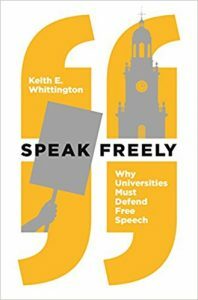 In his new book Speak Freely: Why Universities Must Defend Free Speech, Princeton University Professor Keith Whittington relates the Cohn incident to show that the intolerance we see so often on our campuses today is not a new phenomenon. He is not predicting that American universities are necessarily going to become the kind of politicized university the fascists demanded and got in Germany, but warns that the freedom to speak your mind without fear of vicious retaliation is very much in danger here. Equally disturbing are the demands for “safe spaces.” That movement, Whittington shows, began with intellectually dodgy courses in identity politics where some students claimed they were “comfortable” and able to express their feelings openly. The problem was that while some students had their feelings validated, others had to self-censor because the classes made them feel unsafe to express doubts about the supposed “truths” they were being steeped in. From a space in which students can feel comfortable sharing their experiences and expressing their feelings, the focus has shifted to an “identity-safe environment” in which students feel accepted and welcomed for who they are and feel free from the perception that they might be judged on the basis of features of their self-identity. As the possible threats to a student’s self-esteem multiply and grow increasingly subtle, the demands for actions to eliminate those threats grow apace. Thus we hear complaints that women students feel “unsafe” in a math workshop where there are more men and that students feel unsafe because some professor is an advocate of the Second Amendment. College life more and more is being driven by the emotions and beliefs of students who know there is a good chance that administrators will not risk conflict by telling them that they should stop behaving like whiny children. The loudest of all student demands is that officials must censor or punish “hate speech.” Whittington points out that when students and administrators declare that the First Amendment does not protect hate speech, they are in error. The Supreme Court has never carved out a “hate speech” exception to the First Amendment’s prohibition against government infringement on freedom of speech or the press—but that legal point is completely lost on those who want to silence their intellectual adversaries. 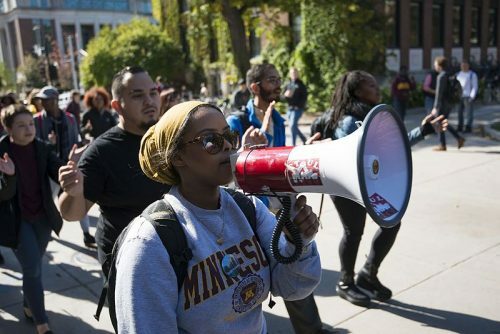 They claim that some speech is not merely words, but “verbal violence” which campus authorities should prevent, and students are justified in preventing if the former do not. The idea that a hate speech exception would be applied strictly and stay limited flies in the face of our historical experience. When charged with the duty to suppress hateful speech, officials have repeatedly understood that duty as a mandate to suppress unpopular speech and speech they personally find offensive and unpalatable. That is the same reason why the Constitution bans laws that interfere with free speech—we cannot depend on politicians or college officials to decide what will and will not be permitted. Where do we draw the line between legitimate dissent from a point of view and actions that interfere with the exchange of ideas? It is important, Whittington argues, that campus authorities allow students to make arguments against speakers or policies they oppose, but not to let them prevent listeners who want to hear what someone has to say from taking advantage of an opportunity to learn. Questions and comments, even harsh or impertinent ones, should be allowed, but shouting down or heckling to the point where discussion is impossible should not be. Universities do not only have a problem with intolerant students who want to silence those who disagree with them, Whittington observes, but also have a problem with faculty who are more subtly doing the same thing. In too many departments and disciplines, speech or writing that challenges conventional wisdom is apt to get the daring scholar in very hot water. That is not just true for conservatives and libertarians, but also for leftists who deviate from the approved patterns of thought, such as Laura Kipnis and Rebecca Tuvel. Speak Freely is a measured, eloquent argument that American colleges are moving in a dangerous direction, toward a world where speech is only allowed if it supports the dominant belief system. Unfortunately, the people who are pushing us in that direction are mostly impervious to rational argument. While Whittington does not yet think we are in a crisis, his book leaves you feeling that the crisis is just around the corner.